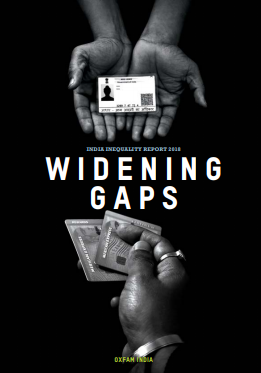 A general misconception around inequality in India is that the level of inequality is low by international standards. However, such a comparison is largely misplaced as inequality in India is usually measured by the consumption expenditure data, which is not comparable to inequality in most countries which is measured by income dimension. While there is no one-to-one correspondence between income and consumption inequality, evidence across countries suggests that consumption inequality is generally lower than income inequality. This happens largely due to the fact that consumption, as measured by the National Sample Survey Office (NSSO) in India, tends to underestimate the consumption of rich. It is also because consumption is a smoothed measure, unlike income. Therefore consumption inequality, in general, is found to be lower than income inequality. But even on a comparable measure of consumption inequality, India is not a low-inequality country. There are few income estimates available for the country as a whole but the limited information available from private surveys suggests that income inequality is not only high compared to countries with similar per capita income, but is also increasing. The fact that inequality in the country is not only at a high level but is increasing in the last three decades is now confirmed from various sources of data and on various independent measures of inequality. 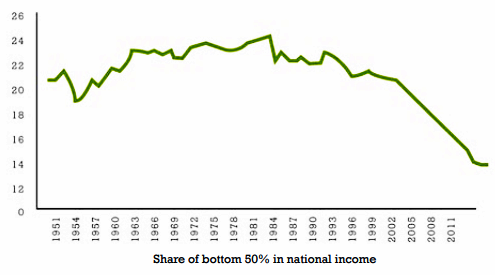 The most credible measure of inequality in the country is based on the consumption surveys of the NSSO. Based on these, the Gini of consumption expenditure as measured by the National Sample Survey (NSS) consumption expenditures surveys report a rise in consumption inequality from 0.32 in 1993-94 to 0.38 in 2011-12 for urban areas. Corresponding estimates of Gini of consumption expenditure in rural areas is 0.26 in 1993-94 to 0.29 in 2011-12.10 On income inequality, the latest data on income inequality is available from the India Human Development Survey (IHDS) reports which show income inequality in India in 2011-12 at 0.55, up from 0.53 in 2004-05 which puts India among the high inequality countries. But even on wealth inequality, India is among the most unequal countries in the world. According to the Credit Suisse Global Wealth Report (GWR), 2017, top 10% of the households held 52.9% of the total wealth of the country in 2002 which increased to 62.1% by 2012. 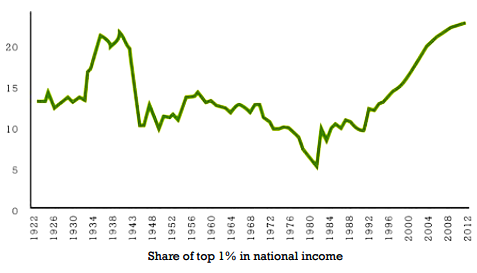 The corresponding share of wealth held by the top 1% also increased from 15.7% in 2002 to 25.7% in 2012. The share of wealth held by the top 1% in India is only second to the United States among the major countries for which the data is available. The Gini of wealth in India in 2017 is at 0.83, which puts India among the countries with highest inequality countries. The corresponding estimate of Gini for wealth by GWR 2011 reports it at 0.804, suggesting an increase by 0.03 percentage points in the next six years. According to GWR 2017, the bottom 50% of the population in India held 8.1% of total wealth in 2002 which declined to only 4.2% by 2012. In contrast, the top 1% of the population held 15.7% of total wealth in 2002 which increased to 25.7% of total wealth by 2012. Among the countries for which GWR gives the share of wealth held by the top 1%, only Indonesia and the United States have higher shares of wealth than India. Forbes releases annual data on billionaires which details their sources of wealth. By these estimates, the wealth held by the richest 100 billionaires, increased from $49 billion in 2004 to $479 billion in 2017; the wealth held by billionaires increased almost 10 times in a decade. There has been a steady rise in the number of billionaires as well – from 12 billionaires in 2004 to 46 in 2012 and 101 in 2017. India is fourth, behind the United States, China and Germany, in the number of billionaires. The wealth of Indian billionaires was less than 5% of the GDP until 2005 but increased sharply to 22% in 2008; it however declined after the financial crisis to 10% in 2012. By the latest estimates, the total wealth of Indian billionaires is 15% of the GDP of the country; this has risen from 10% only five years ago. Interestingly, almost 40% of Indian billionaires have inherited their wealth; the inheritors account for almost two-thirds of the total wealth of billionaires. In 2004, of the 13 billionaires, two belonged to the pharmaceutical sector and two belonged to the IT sector; the remaining made their fortunes in rent-thick sectors. In 2010, of the 69 billionaires, 11 were from the pharmaceutical industry and six from IT. In comparison, 18 billionaires made their fortunes in construction and real estate (15 of them in real estate alone). Seven made their fortunes in commodities (metals and oil), and two in telecom. That makes 27 billionaires in rent-thick sectors. The total wealth of knowledge-based sectors (IT and pharmaceutical) is $55 billion, against $132 billion in the rent-thick sectors. Services account for only 20% of the total wealth of the 66 resident Indian billionaires. How do they compare internationally? The net wealth of the 100 richest Americans in 2009 was $836 billion; that of the 100 richest Indians was $300 billion. That is, the richest Americans are almost three times richer than their Indian counterparts. There are eight Indians among the top 100 billionaires in the world; there are none from China. Of the top 20 billionaires in the United States, eight are from the IT sector, three from finance, five from retail, and one from media. Of the remaining three, two are from engineering and one from real estate. In other words, one billionaire out of 20 is from a rent-thick sector. Among the top 20 in India, nine are from such sectors. All 15 real estate billionaires in India joined the club between 2005 and 2010. Incidentally, they have also seen the fastest rate of wealth growth; the IT sector billionaires have among the lowest rates of wealth growth. Twenty billionaires out of 46 in 2012 had their primary source of wealth from rent-thick sector: seven from real estate, construction, infrastructure or ports, three from media, and the rest from cement and mining. While rent thick billionaires accounted for 43% of all billionaires, they accounted for 60% of the total wealth of these billionaires. Clearly, the richest in India have made their money through crony capitalism rather than through innovation or the fair rules of the market. Crony capitalism is defined as a system where businesses multiply their wealth not by the fair rules of the market, but through their nexus with governments. Classic examples of crony capitalism are the distribution of legal permits, licenses, land, contracts, tax breaks and so on. It is this crony capitalism which later surfaced in the form of various scams, such as the 2G spectrum scam and the coal scam. So is the case of real estate billionaires, many of whom benefitted from cheap land allotted to them by the governments. It is worth noting here that the majority of the 12 companies which have been reported for bankruptcy proceedings in 2017 are from rent-thick sectors, such as housing and steel. Not only have the richest benefitted from undue favours granted to them in the allocation of natural resources, they have also got easy credit from the financial sector. A look at the non-performing assets of the public sector banks has clearly established that the majority of these companies are held by the richest Indians.